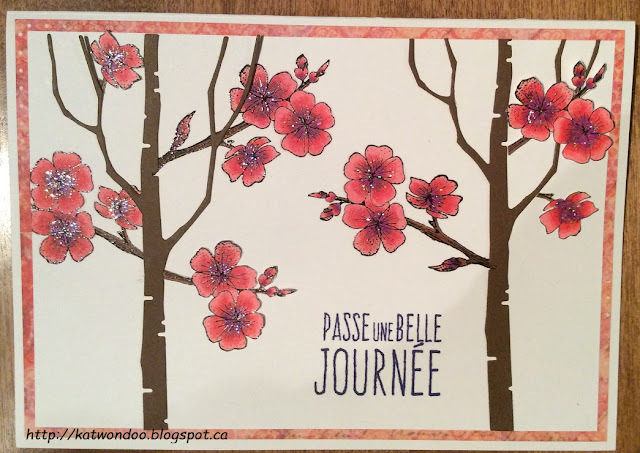 Today I'm showing you a card I made for my grandmother. I love sending her cards to tell her I'm thinking about her. I was first inspired by SSS Monday challenge Leap into the unknown. When I make a card, I usually think about everything before starting it. For this one, I didn't have any plan or idea, I just knew I wanted to use my Memory Box tree die on the card. I made 2 trees dies cut and stamped some flowers directly on my background, aligning them with the trees. For more dimension, I then glued the trees on the stamping so some flowers would appear behind the trees. I also stamped the flowers on another cardstock and hand cut them as I didn't want the full branch. I colored everything with Spectrum Noir markers, using colors matching my background patterned paper. For some texture (SSS Wednesday challenge), I added Stickles inside the flowers. Then, I stamped my sentiment with SSS ink. Gorgeous stamping and composition! Thanks so much for playing Simon Says Stamp Wednesday “Touchy Feely” Challenge!